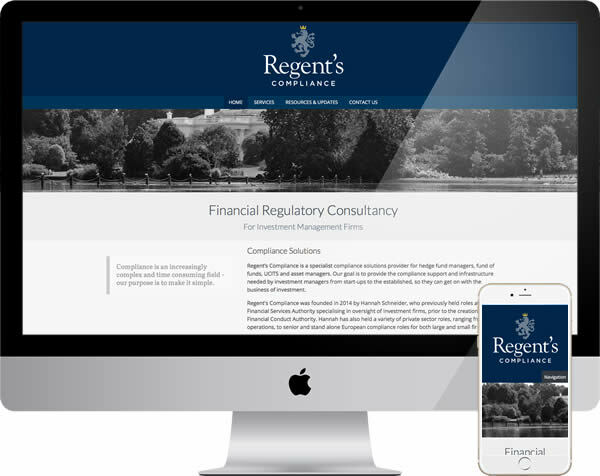 Brief – Regent’s Compliance is a specialist provider to investment managers. Their founder offering experience from the FSA and similar authorities, to help bring all important regulatory support. The business operates in an area where trust is paramount and required a website to reflect this. Ease of access to mobile users and speed of use would also be important for their sector. Our client simply wanted a small “brochure” website, a point of contact and for users to download compliance information. Their business being built by personal contact and reputation, rather than through search. Technical & Search – Although search success would not be the key, the site still needed to come up for anything similar to the business name and be understood by Google. This would ensure “word of mouth” clients found them and that Google offered a range of URLs. Better for most businesses if they can establish Google sitelinks, extra URLs in search for contact and information pages. Although we are WordPress fans, this is not always the solution. With the size of the website, speed, device compatability and ease of use in mind, the website was hand built into a small content management system. Design & Build – Regents Compliance would not wish to look anything other than a private sector company, yet at the same time needed to reflect stability and trustworthiness. Their lion rampant logo helped set the tone, matched by a straightforward, traditional colour scheme. A professional, subtle mix of fonts and accessible layout fitting with the approach. Although secure options were discussed, the download facility was added as an integral part of the resources section. Open to existing clients they could notify and to new users who may find the information valuable. Outcome – This website was designed to meet specific needs and does so ideally. Easy for visitors and the owners to use, also a good reflection of the image they wish to build. Clients are happy to be there and Google pleased to help them find the website, contact details, or niche information. Testimony to the value of the web being more than just a focus on search success. You can see more examples of our range of work, or read about services we offer, in our introduction to web design. By all means get in touch, if you would like to discuss your own web project.